James H. Graham’s ARDS story begins with his birth on February 20, 2005. He was the fifth child and only son born to Chris and Lena Graham. Lena delivered James at a hospital in Michigan City, Indiana. After his birth, which was four weeks premature, nurses noticed that James’s color was sort of an ashen gray, as though he was not breathing properly. James was taken to the nursery and placed in an oxygen tent. Hours passed; tests were run. Finally, the pediatric specialist told his parents that he James may have inhaled some meconium and it was causing difficulty breathing. James was then transferred to Porter Memorial Hospital in Valparaiso, Indiana, four hours after his birth. Lena had yet to hold her son and had only seen her baby when Chris was able to hold him for a brief couple of minutes. James only weighed 5 pounds, 12 ounces at birth. 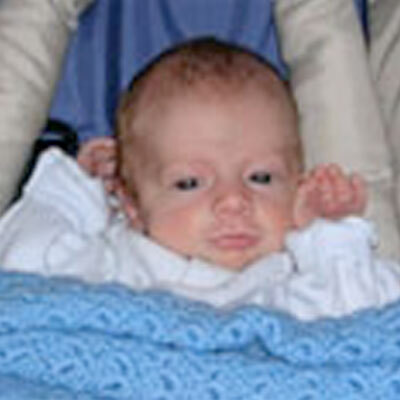 When James arrived at Porter Memorial, he was placed in an enclosed crib and given oxygen. after several chest x-rays showed a ‘cloud’ on his lungs especially the left side. They reassured the family stressing the importance that James had made it the first 12 hours. This time was especially difficult as Lena could not be with James as she was not yet discharged, and Chris could not be with Lena, and neither could be with their four other children. On the morning of February 21, 2005, Chris learned that James would stay at the hospital for several days because his lungs were not clearing as quickly as they had hoped. Chris was able to hold James briefly, but due to tubes and wires, he was not able to hold him as most parents hold their newborns. Chris felt helpless and then ashamed that he felt that way, considering the state that James was in. On February 23, Lena was going to see James for the first time since his birth. They arrived at the hospital to find James’s left lung was clearing up and that he was able to breathe room air the previous evening. He had eaten from a bottle just that morning. .And he was moved to a new bed, called an isolette. All wonderful news and Lena was able to hold James for the first time. Lena and Chris again watched helplessly as James was loaded into yet another ambulance and sent to Advocate Christ Medical Center in Oak Lawn, Illinois. Over the next two weeks, Chris and Lena were at the hospital every day. At one of the visits, the doctors said that they were concerned with James’s lack of progress with his right lung. Risky tests were performed and after, Lena and Chris met with four specialists. James now had a diagnosis: Lymphangiectasia of right lung, absence of right pulmonary artery, absence of inferior venacava , and finally, hypospadius. Doctors discussed what to look for and how to care for a child with one lung. After three days of preparation, Lena and Chris went to the hospital with the hopes that they would finally be able to bring little James home. And that is just what they did! Home for about two weeks, everything was wonderful. James had many visitors and then got sick. His viral pneumonia resulted in four more days in the hospital but then, James came home with a breathing machine and treatments three times a day. On April 8, 2005, James had received his usual evening breathing treatment but later that night, Lena woke Chris and said that she was giving James a special medicated treatment used when James labored a lot of breaths. The treatment seemed to help. However, after breakfast, James vomited and his eyes rolled up into his head. He turned ash gray and stiffened in Chris’s arms. Fear instantly shot through Chris and Lena, and then Chris administered infant CPR to help James breathe. James was rushed to the emergency room and they were told that James had had RSV (respiratory syncytial virus). James went back to Hope Children’s Hospital. The next few days passed slowly. On April 17, James needed a blood transfusion. The following day, Chris and Lena were told to come to the hospital. They went to James’s room immediately upon arriving and though they were used to seeing tubes and wires, they were shocked at the sight of the ventilator. It was more than they were prepared for. The on call doctor showed them James’s latest x-ray compared to the one taken that morning. It looked like the bottom quarter of his lung had disappeared. James had ARDS. James was on 100% oxygen. Doctors gave him a 50/50 chance that he would survive the weekend. Lena and Chris did not even have time to understand his ailment. They slept at the hospital that evening and had a meeting with the pulmonologist who said that there were three choices: stop life support, sign a DNR order, and pray. None of these choices sounded good to Lena and Chris and they not stopped praying for James this entire time. They were informed they could try an experimental treatment but James would have to make it until Monday April, 21, 2005, before they could begin. They were told that it was unlikely James would survive through Saturday. The ARDS combined with James’s one working lung was putting a strain on his heart that could actually be seen. His blood pressure dropped hourly. Sadly, on April 19, 2005, James passed away from Myocardial insufficiency caused by ARDS. James H. Graham is loved and missed by all. He is survived by his mother, Lena, father, Chris, and four sisters, Rebecca, Cylest, Courtney, and Charlotte.